Dismantling the BA-35 Solar reveals a small surprise. Instead the internal construction known from all other members of its family it makes use of two printed circuit boards (PCB's). The larger of the two PCB's holds just the keyboard and is screwed down instead the usual heat stakes. The single-chip calculator circuit is assembled on the bottom side of the smaller PCB's and hidden under a small blob of epoxy resin. • One-variable statistics with frequencies. Calculates mean, sample standard deviation, and population standard deviation. 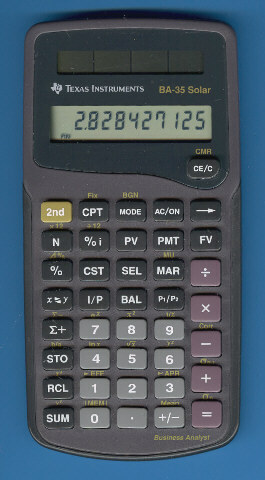 Compare this stylish BA-35 Solar with the last edition of the BA-35 and the first Financial solar calculator BA-SOLAR.